Fluids in Factorio have a speed limit. The exact value depends on the distance between the full pipe (attached to a pump, chemical plant, or merging pipes) and the empty pipe (attached to a chemical plant or steam engine). This limit reduces the capacity of long pipes. Pipe-to-ground helps, it counts as 1 pipe and can reach 5.5x as far. But even pipe-to-ground slows down if you stretch it too far. The solution is small pumps! Small pumps pressurize a pipe until it is full again, allowing you to stretch pipes as far as you like without losing speed and capacity. Just remember to put a pumping station before your flow rate drops too far, because once it drops below the limit it is impossible to speed up again. Each small pump can only handle 30 fluid/sec, so you need to use them in parallel. Here are the optimal designs for each size pumping station. Quite interesting stuff. How did you measure/calculated that? ssilk wrote: Quite interesting stuff. How did you measure/calculated that? but for normal pipes I don't know. This topic caught my interest enough to stop lurking and make a forum account! I am also very curious to how you measured this OP. I did some testing of my own, but all of it had very flawed methodology, and I was only able to experimentally confirm that the small pumps are definitely 30/s and that the offshore pumps appear to be 60/s. Practically however, this information seems to work. I've constructed a steam plant based on the given design and so far its working great! not up to the 25 in the example yet (only 20), but still way more than I have ever hooked up to a single pipe before. The best test I can think of so far (I didn't have the resources to try in the game I'm working on atm) is to use barrels. Loading the far end of the pipe into barrels should keep it empty and allow for more accurate counting of moved fluids. The easiest method is to take some steam engines (6 water/sec each) and hook them up to an independent radar network so they run at 100% capacity. Then add pipes until you see the performance of one steam engine drop. I initially used pumps and storage tanks as my endpoint, and built a spreadsheet of fluid levels and timestamps. But keeping the tanks from getting too full was quite annoying. Steam engines are fine if you just want to calculate pump breakpoints. Currently all fluids flow at the same rate. Is this still accurate for 0.12.x ? I'm looking for information on transferring mostly oil over long (>100 tiles) distances, but also acid, petroleum gas and lubricant. AFAIK there was no change in the pip-physics since 0.11. But you can look through the changelogs. jockeril wrote: Is this still accurate for 0.12.x ? Assuming you're not playing with any mods that change the properties of fluids, all base game fluids behave the same in regards to transportation. Their pressure_to_speed_ratio is always 0.4 and their flow_to_energy_ratio is always 0.59. YJSubs wrote: Is there a technical reason why you design the 4 pump asymmetrically ? Left design instead vs right design? Your design has a tiny bit more pressure on the output, but much less suction on the input. Why do the pumps need to be at right angles? Why not just put them in a line, then connect the inputs and outputs together with pipes? immibis wrote: Why do the pumps need to be at right angles? Why not just put them in a line, then connect the inputs and outputs together with pipes? Water pumps don't have inputs you connect to - only output. Small pumps have the input in the rear and output on the front. Which did you mean? can you show a picture to demonstrate? It'a about throughput I think. There are some extensive tests on wiki for various fun stuff with liquids. In general pump has only 30 fluid/s while pipe can transfer up to 60 fluid/s. So if you want to use small pump and get full pressure you need to put two of them in parallel. I'm writing from memory so might forgot something. If you put 5 pumps in a line, you have already exceeded your 4-pipe budget to maintain 150 fluid/sec. DaveMcW wrote: If you put 5 pumps in a line, you have already exceeded your 4-pipe budget to maintain 150 fluid/sec. It's not that. If they are in the line then they will provide only 30/sec. In parallel line they should go to 60/sec - can you really go higher then this? 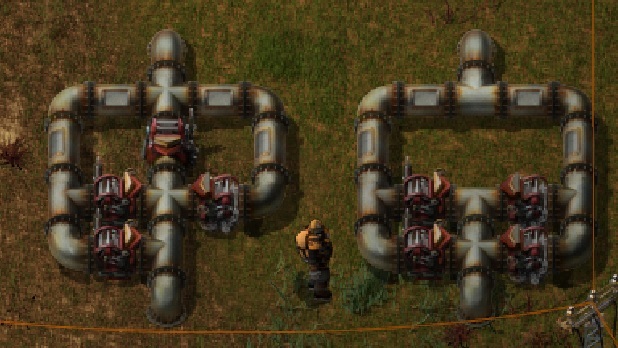 In mods where the fluid physics aren't changed but the pipe capacities are, what's the maximum throughput for the different pipe sizes? Basic iron pipes have a capacity of 10, so a capacity 5 pipe might see all of those fluid/sec calculations halved? Are pumps placed at the source, or at the destination? Or in the middle of a long pipe run? I'm currently in the middle of running a couple of hundred underground pipes from my pumpjacks to my base, and would love to know exactly where to put the pump setup. Targa wrote: Are pumps placed at the source, or at the destination? Or in the middle of a long pipe run? I'm currently in the middle of running a couple of hundred underground pipes from my pumpjacks to my base, and would love to know exactly where to put the pump setup. From what I recall from pumping tests you need to place them regularly to ensure proper flow. I don't recall the distance so you'd need to search for that. DaveMcW could you update the first post to give some concrete numbers? People often quote the post to show how awful pipes are, not realizing that the numbers actually mean pipes have a ginormous capacity and excellent ability to transport fluid over great distances. I'm pretty sure anyone who says pipes are bad, aren't saying that because they have tried to stuff the output of 1000 pumpjacks into a single pipe and found it couldn't take it, but simply because they have been confused by the pressure numbers and think the pipe isn't working because it isn't "fully pressurized".